The Korea Herald is starting a new series, Korean Home Cooking, in which Ro Hyo-sun, author of the Korean Bapsang blog, explains how to make quick Korean comfort foods. The recipes are designed for people who are not familiar with Korean cooking and ingredients. ― Ed. 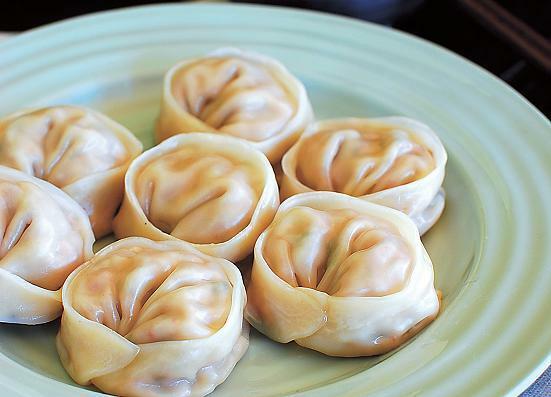 Kimchi mandu is a variation of Korean dumplings made with kimchi as the main ingredient. The key to making good kimchi mandu is to use fully fermented kimchi for the extra kick that this mandu is known for. Kimchi mandu is especially good for making soup, manduguk (dumpling soup) or tteok-manduguk (a variation of rice cake soup, tteokguk, with dumplings), which is a must-eat New Year’s dish. With its pungent flavor and crunchy texture, the kimchi version adds a nice contrast to the mildly flavored broth and soft rice cake slices. For this recipe, I steamed the dumplings, but you can cook them your favorite way. Finely chop the kimchi and squeeze out as much liquid as possible by hand. Squeeze out water from the tofu. Using a cheesecloth will make the squeezing easier. Or, you can put the tofu under a heavy plate or a cutting board to press out water first and then squeeze by hand. Blanch the bean sprouts in boiling water, drain, chop and squeeze out water. Finely chop the onion and squeeze out water. Finely chop the scallions. The squeezed ingredients should be fairly dry and crumbly. Combine all the ingredients in a large bowl and mix well by hand. Place one heaping teaspoon to a tablespoon of the filling on a wrapper. Wet the edges of the wrapper with water or egg wash and seal tightly (pushing the air out with your fingers) into a half-moon shape. (Stop here if you want half-moon shaped dumplings.) Then, bring the two ends together, wet the overlapping side, and press tightly together to create a round shape. Repeat this process until all the filling/wrappers are used. Kimchi mandu can be steamed for about 8 minutes in a steamer (longer if frozen). Make sure to line the steamer with a cheesecloth or paper towel to prevent mandu from sticking. Freeze the dumplings on a tray with no pieces touching each other for about an hour, and then store them in a freezer bag. Otherwise, the skins will get soggy from the moisture in the filling and stick together in the freezing process. Combine all the sauce ingredients and mix well. Serve the mandu with the dipping sauce.